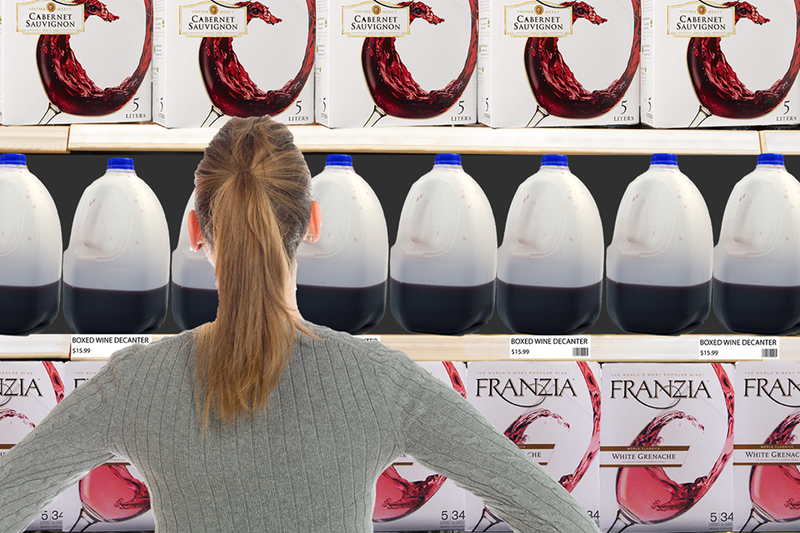 CHARLOTTESVILLE, Va. — In an effort to preserve the integrity of their assorted boxed wine varietals, Virginia ABC has launched the sale of boxed wine decanters in Charlottesville stores. The new decanters, which resemble plastic milk jugs, are set to hit shelves in late July. “Our boxed wine decanters are designed to maintain the flavor profile of boxed wines even more consistently than our line of glass decanters,” Ernie White, general manager of the Barracks Road ABC store, said. White explained that when boxed wines are poured into a glass container, they often lose their subtle plastic taste. Each new decanter is made with the same type of plastic as boxed wine bags, which helps maintain the wine’s affordably-packaged flavor. Over the summer, in addition to boxed wine decanters, Charlottesville ABC stores plan to release boxed wine glasses, boxed ice buckets, and moonshine in boxed mason jars for more discreet consumption at the pool and beach. Hey! You made it this far, so why not visit our online store?